I hope you are all having a great week so far~I am so happy the weekend is here, how about you? I have a lot on my "to do list" to try and accomplish this weekend along with the hopes of getting in my craft room to :) So, are you all ready fro Christmas? It's coming fast, ha? Today, I wanted to quickly pop in to share a Christmas card that I made using a beautiful stamp from My Craft Spot . I thought I better get going since I am a bit behind with my cards and Christmas will be here before we know it, ha? The cluster of flowers are paper flowers which I picked up at Micheal's and adhered in place. I tucked in some cute little leaves using a pine branch punch I had in my stash. I also placed little gems around the oval frame for a little sparkle. I finished with tying a pretty bow with snow white crinkle ribbon and adding a little gem to the center. 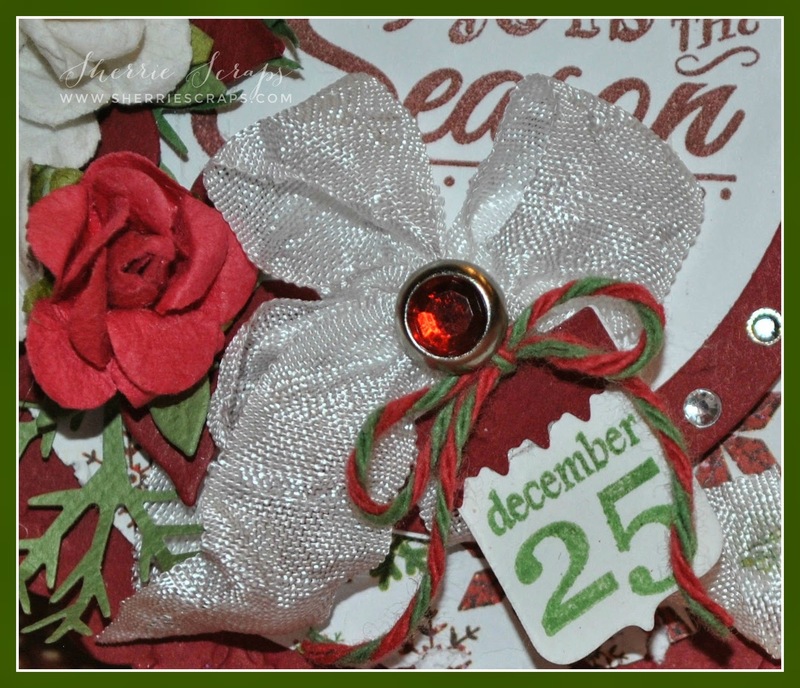 The little tag is created using Tiny Banners & Toppers die and the sentiment is from the Tiny Tags Christmas stamp set. PS: I would LOVE for you to come and join our blog hop right now at House of Cards! We've got prizes! Also, we are holding a design team call and I would be super honored if you would consider applying! HUGS! Gorgeous card! Love all the wonderful details. This is sooo beautiful !!!!!! I love this stunning creation my friend !!!! Hope you have a blessed and wonderful day !!! This is absolutely Gorgeous!! Adore the pretty flowers, bling and ribbon!! A lovely sentiment and a very sweet tag! Awesome job my friend!! Stunning card!!! I love the flowers on here and that beautiful patterned paper. SO lovely and just perfect for this time of year. Thanks so much for joining us at Scrapy Land Challenges! Oh my gosh, Sherrie, this is jaw-droppingly gorgeous!! Wow!! What a beautiful card!! I love the shape and those amazing flowers!! I need that pine branch punch!! The papers are so pretty!! I love everything about this fabulous card!! It's elegant and stunning!! Thank you so much for playing along at Scrapy Land and My Craft Spot!! Such a beautiful Christmas card! I love all the details you put on this card with that pretty paper, flowers and that adorable bow! Thanks for playing along with us at Scrapy Land Challenge #7! Soooooooo gorgeous!! I love love love love the colors and the flowers!!!!!!! Hi Sherrie, your card is beautiful! I am still in denial that we are in December! Another year I won't be getting Christmas cards out. Anyways I finally picked up a new car today after looking for what seemed like an eternity. And Kimber can never be replaced but I needed a buddy so I picked up a stray puppy that is keeping me busy. Slowly recovering from life these past few weeks! Hope all is well with you and thank you for your sweet comments! Sherrie, this is stunning! The paper is so beautiful and is the perfect base for your amazing design! 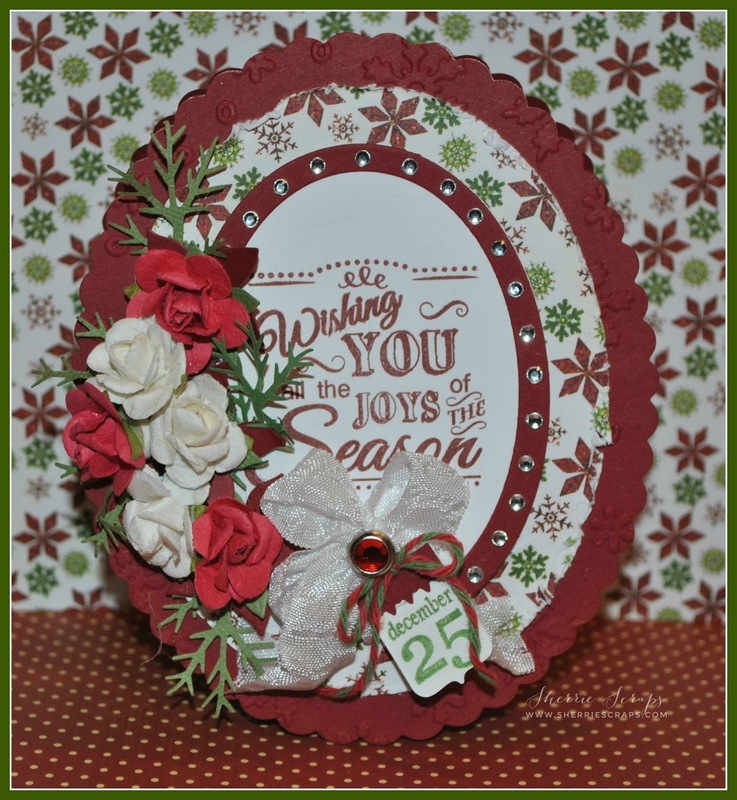 The deep red sentiment is gorgeous and I love the sparkly border and flower cluster. The tiny tag is the sweetest accompaniment. So pretty, my dear friend! Thank you for sharing your creativity with us once again this week at My Craft Spot! Have a sparkly weekend! Oh my - what a gorgeous card Sherrie! I love the beautiful, scalloped oval base - so pretty. Your colors are just classic Christmas and those flowers are fabulous. This is just stunning and I love everything about it! Hope you have a great rest of the weekend and get your to do list down lower! Sherrie, this is just amazing! I love the flower treatment. I love that stamp set, I really need to add that to my cart!!! I have so much on my to do list too. I didn't get all the things done today that I had hoped. Seeing as I am out of town next week for appointments....that will eat up a big chunk of my days traveling to and from. You rocked the sentiment as the focal image no doubt! Another stunner. What an elegant Christmas card!! I love everything - the sentiment, the colors, the shape, the flowers and the ribbon/twine!! 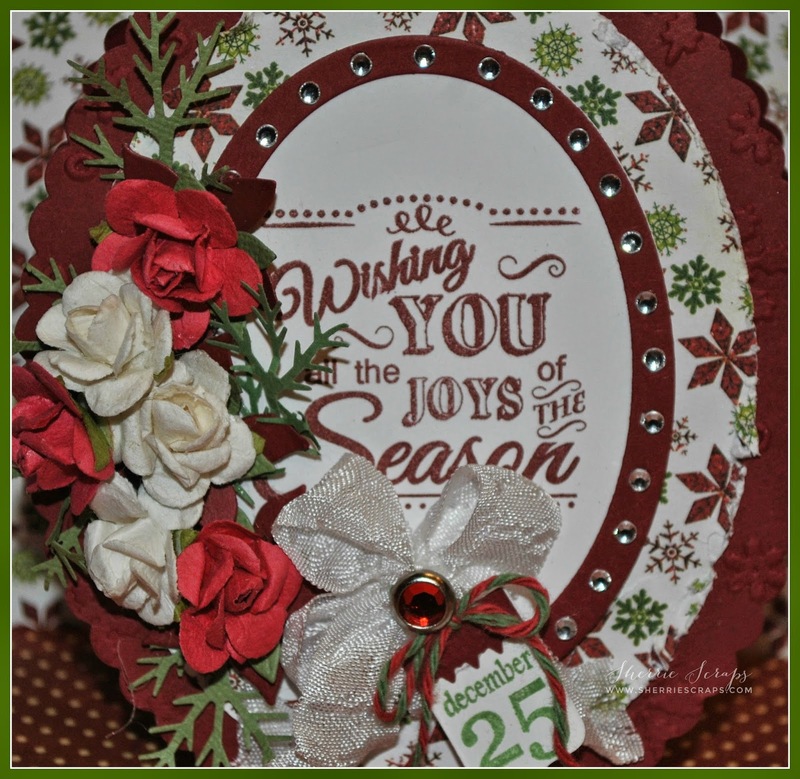 Thanks for linking up with the Craftin Desert Divas "Christmas" linky party!! What a beautiful and elegant card!! Love the papers and the pretty flowers you used!! Have a great day. Beautiful card, love the gorgeous holiday colors! The design is simply amazing! Love how the sentiment is the centerpiece of your card and all of those flowers look fabulous! Hope you had a wonderful weekend! So beautiful. Thank you for Linking Up at PDE Linky Party. This card is just gorgeous Sherrie, love the flowers and the paper is perfect!! Sherrie, your card is so gorgeous! It's got a lovely elegance to it and could be a decoration in and of itself!! Wow!! I hope your to-do list is getting shorter. I've got so much done - but there's still more to do. It's such a busy but fun time!! Enjoy!! Extremely pretty, especially with all the flowers. Oh my goodness what a GORGEOUS card... The paper and flowers are just stunning! I love the added rhinestones! BEAUTIFUL!!! Another GORGEOUS card!!! OMG I am so LOVING those flowers! So very pretty! Love the tiny little tag. Thanks for sharing with us at IBS!